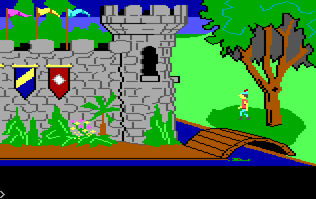 first out is King´s Quest from 1983 released on the IBM PCjr and King´s Quest: Quest for the crown from 1984. King’s Quest is a graphic adventure game series created by the American software company Sierra On-Line Inc (now Sierra Entertainment). It is widely considered a classic series from the golden era of adventure games. Following the success of its first installments, the series was primarily responsible for building the reputation of Sierra. Roberta Williams, co-founder and former co-owner of Sierra, designed all of the King’s Quest games until the series’ reboot in 2015. The King’s Quest series chronicles the saga of the royal family of the Kingdom of Daventry through their various trials and adventures. The story takes place over two generations and across many lands as the heroes and heroines fight evil witches and wizards and other villains.